A new and unique way to display a kukri in an upright position that is made possible by KHHI's vertical wooden stand unlike any other displayers.. This vertical display stand is completely handmade by using only conventional domestic tools. It is made out of treated wood called Ashna, famously known in Nepal as “Seesau”. The process of making a single stand is very slow and laborious. It is as time consuming as making a Khukuri, costing almost a complete day to finish one. All stands are made in Kathmandu where skill craftsmen work around the clock to give quality and quantity. They are foldable (hands come apart) so that they can be carried and transported very easily. They are also completely break-free since they can be swiftly dismantled. 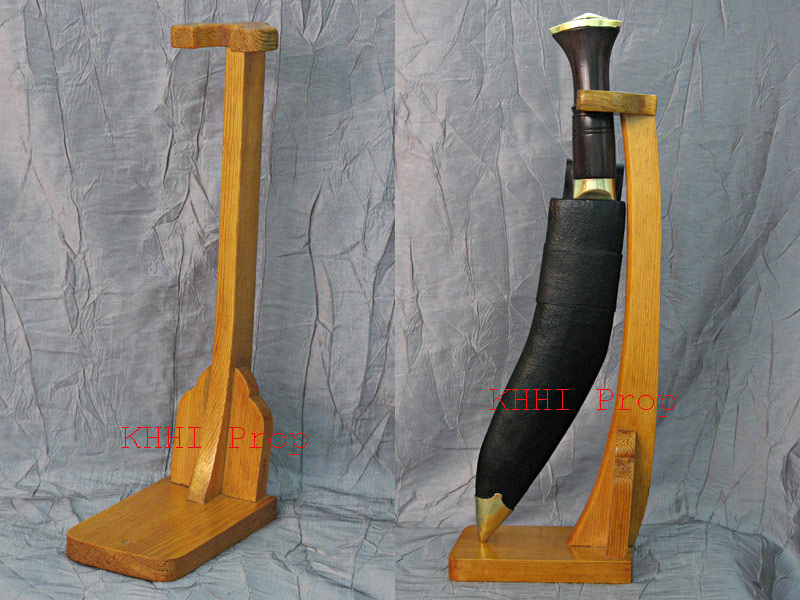 A new and unique way to display a kukri in an upright position is made possible by KHHI’s vertical wooden stand. Unlike any other displayers the vertical stand displays or accommodates a kukri, either only the blade or along with its scabbard vertically as shown in the picture exhibiting a unique and perhaps a better look than other displayers. 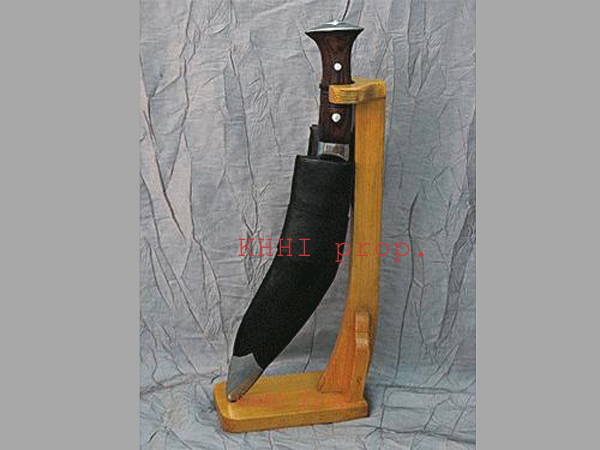 The flat base is simple yet suitable from where an arched shaped shaft is erected and fitted on top of it is a “U” shaped wooden piece to hold the handle of the displaying kukri as depicted in the picture. The wooden base also has a small round hole opposite side of the erected shaft to secure the pommel or tip inside it so the movement or sliding is prevented. The spine of the blade or scabbard lie on the erection and handle rests in the holder. The flat base/platform and the erected wooden are screwed to each other thus can be flattened by unscrewing; easy to pack or transport. 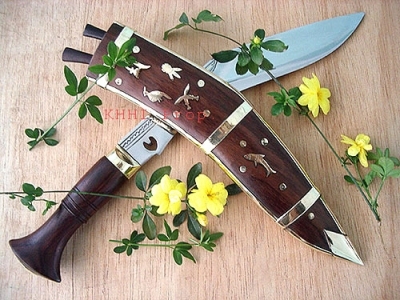 An amazing and creative way to display your kukri to wow your visitors. First ever made by KHHI nepal.